In the Golden and Silver Age, Batman's foes were mostly harmless. Joker was psychotic, but he wasn't a mass-murderer until the modern age. While some villains have stepped up the threat level over the years, others have been left behind, which is why it can be hard to remember that the "losers" used to be every bit as dangerous as the big boys. A murderous gangster, Oswald Cobblepot grew up fascinated with birds, in part because his widowed mother ran an exotic bird shop. Nicknamed "The Penguin" by his cruel classmates, the villain would ultimately take his revenge on the citizens of Gotham City, earning him the attention of the Dynamic Duo, Batman and Robin. He is both evious and ruthless, usually flying from the scene of his crimes. The Penguin is an interesting member of Batman's rogues gallery. He's well-known thanks to Burgess Meredith's hammy portrayal on the 1960s Batman TV show, but in the comics he hardly has the status of such Bat-foes as the Joker, Two-Face, Catwoman or even Man-Bat. In fact, in the comics nowadays the Penguin mostly just runs his nightclub - the Iceberg Lounge - and serves as the underworld's information broker. This is a great role for the character, but it doesn't exactly make for life-and-death struggles with the Dark Knight. Nonetheless, he's probably the most iconic Batman villain who had yet to be sculpted by the Four Horsemen. He's also a fondly-remembered favorite from DCUC's spiritual predecessor, Kenner's Super Powers, so it's no surprise he turned up in DCUC Series One. Some fans were disappointed with the vaguely grotesque look of the Penguin's face, with some likening it to the work of Mike Mignola (though to anyone sane, that's a compliment, but I digress). The best thing about the Penguin's sculpt - aside from the Horsemen's usual attention to detail - is his squat, stout body shape. For the most part, Mattel and the Horsemen are trying to maximize the number of characters they can make by creating just a few different body types, then retooling the bodies to make different characters. This works very well for superhero toys, since Batman, Superman and Green Lantern all wear pretty much the same skintight spandex and have roughly the same build. So far there appears to be five body shapes in DCU Classics: generic muscular; slender muscular; teenager; stout (Penguin) and friggin' huge muscular. Somehow, I doubt they're going to find much re-use for the Penguin sculpt. How many other squat, fat, well-known characters are there in the DCU? Can you think of even one? With some minor exceptions (such as Red Tornado's trim), the paint applications are the best I've seen on mass market figures and even outdo some specialty market lines. There's very little of the glossiness that makes so many mass market figures look toyish. The Super Powers Penguin was famous for his bright blue tuxedo jacket and top hat, blinding yellow cummerbund and purple pinstripe pants. The Horsemen have calmed his wardrobe down a bit, giving ol' Oswald Cobblepot a more respectable black jacket and hat. The jacket is a separate piece (not including the sleeves) of soft, pliable rubber that fits over the waistcoat, giving a more realistic impression of clothing. 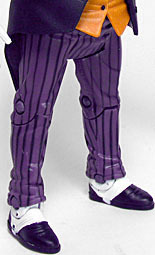 He still retains some of his outlandishness with a bright orange waistcoat; and the pinstriped pants remain, though they're a darker purple and the pinstripes are actually painted on this time. The paints have been applied well, with little to no slop anywhere. Particularly impressive is the detailed work on the head, such as the shiny, yellowed teeth, the golden monocle, and the bright blue eye. Oswald has the least articulation of the series. He has a balljointed neck and balljointed shoulders; hinge joints at the elbows, knees and ankles; and peg joints at the biceps, wrists, and waist. The hips I'm not so sure about. They appear to be simple peg joints, but I'm not convinced that they aren't composed of the peg half of a peg-hinge joint - meaning they do have some very little motion from side-to-side, but it's mostly restricted by the coat. The same goes for the ankles - they don't seem to have the same side-to-side motion as the rest of the line, but there might be a little there. In any event, I think there's enough articulation for the character - the Penguin isn't known for his spinning roundhouse kicks or doing the splits. The Penguin comes with his trademark umbrella, which is painted in black and silver to resemble a gun - or "bumbershooter," as he calls it. 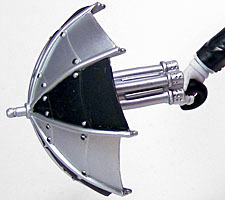 There's also a Gatling-style gun attachment that clips onto the umbrella's handle, but the nitpicking nerd part of me wonders how the gun is supposed to work. It doesn't have its own handle, so presumably it's supposed to shoot through "holes" on the umbrella - but how? Does it use synchronization gear like the machine guns on WWI fighter planes, which were designed to fire between the propellers? It's an awesome-looking accessory, but trying to figure out how it's supposed to work keeps me up at night, tossing and turning in fevered dreams. 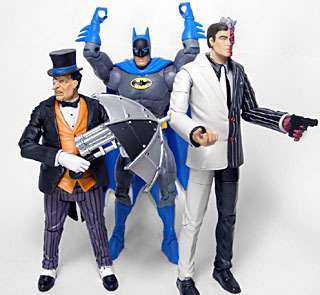 When Mattel showed off the first series of DC Universe Classics at the San Diego Comic-Con 2007, Penguin had another accessory. Much like Bane and his teddy bear Osito, Penguin was planned to come with an animal companion - somewhat. Inspired by Tim Burton's Batman Returns, he would have included a missile-toting robotic penguin. Would the penguin have been articulated? Would the missile have really fired? The world may never know. Mattel has followed ToyBiz and Hasbro's lead in creating a Build-A-Figure for their superhero line. It's an idea that was kicked around for the previous DC Superheroes line, but a lack of sizeable characters in the Batman or Superman families nixed it. Now that the license has expanded, the DCU BAF is back. 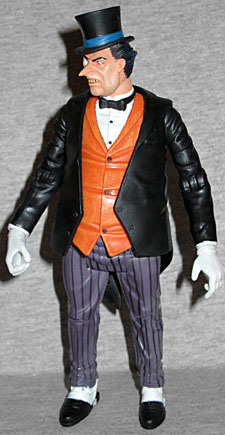 The inaugural series' figure is Metamorpho, and Penguin comes with his head and torso. Considering how frustratingly difficult it was to find the villains in the DCSH line (it was more a case of serendipity than anything else), it's nice to see one of Batman's most recognized foes has made it into wide release with this first series of this expanded line.